Super fun and intense gameplay keeping you on the edge of your seat. you are just a click away from this breathtaking aquatic life adventure filled with joy and thrill. Capture! Move! Ascend! Descend! Some of the thrilling gestures you need to go through while playing this game. Can you keep up with this incredible aquatic adventure! Earn different kind of shrimps while making your way through the stages. compete against challengers from all over the world and unleash your favorite amazing characters. Once you earn lots of shrimps you can purchase new characters and make pearls. plenty of fun new characters with different skills can be purchased. points awarded varies upon earning different kinds of shrimps. There are three different speed levels to choose from, difficulty level increases as the speed increases. avoid enemies and obstacles throughout the stages and work your way towards the stage completion. During the stages you can collect heart for the recovery of physical fitness and three droplet skills to enhance the skills of your character. dive through the three air bubble rings to clear the stage. Grow pearls with acquired shrimps and strengthen your character skills. if you strengthen your skills with the grown pearls not only the skills will strengthen but the appearance of the character will change as well. Last but not the least ◆ The Infinite Stage!! If you are the type of person who likes to play randomly without the set goals and stage restrictions, then we just got something as much thrilling for you too! there are no predefined regular stages here, stages will appear randomly and infinite stage ends when your physical strength disappears.for infinite stage the score is calculated with various factors such as m number, number of shrimps acquired, number of skills used and rewards.There are pearl gifts for top rankings, depending on certain rankings.Strengthen the character and aim for the top ranking! ▪	Earn shrimps, avoid obstacles to clear the stages. 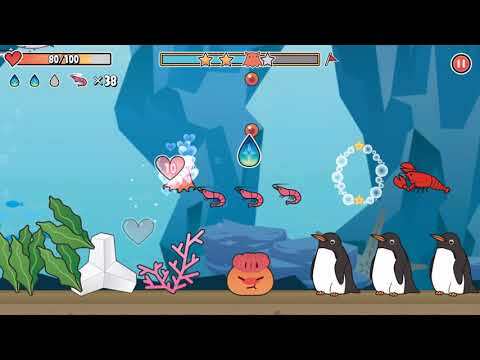 ▪Unleash new fun characters with earned shrimps. ▪Compete against challengers from all over the world for the infinite stage. ▪Three different difficulty modes to choose from. ▪Collect heart for physical recovery and droplets for skills enhacement. ▪Infinite stage with random levels. Internet connection is required for full game features.